On Monday I met a man in a cemetery ... it's OK, it wasn't an assignation, I was searching for war memorial gravestones with the OH and this chap asked what we were doing. After a bit of an explanation he got very interested and offered to let me have or copy a First World War memorial card that he had found in his grandfather's effects. He knew the man was from Cudworth and was probably on the Cudworth War Memorial. Of course, being me, I was very excited at this, but I tried to hide my urge to do a little dance (I was in a cemetery after all) and exchanged name and contact details with the man; let's call him SG. SG turned up at the Cudworth Local History and Heritage Group (CLHHG) meeting today after phoning me to double check time and place. 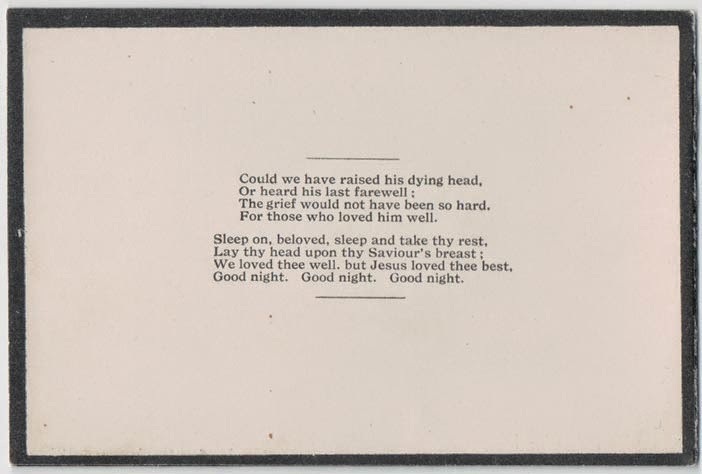 He had brought the little memorial card and very reverently I copied it with my FlipPal scanner. Who Died of Wounds in Francy, August 1st 1916, Aged 21 years. The card was about the size of a large post-it note, 4"x 3" (look I'm old I work in imperial! - that's 10cm x 7.5cm for you modern people!) and it had obviously been kept folded so the dedication was visible. When I opened it out to see the front the hinged part felt very delicate. Now I'm back home I'm going to see what else I can find out about George Alfred Morley. For starters he's in the CLHHG book, Lest Cudworth Forgets, and he is listed on the Cudworth War Memorial as SG suspected. His entry in the book includes a little photograph which looks as it it probably comes from the Barnsley Chronicle and notes, "George Alfred Morley, single, was the son of Mr C H Morley of 181 Pontefract Road, Cudworth. Prior to enlisting at Barnsley he worked as a miner at Grimethorpe Colliery. Private Morley died of wounds on Tuesday the 1st August 1916 and was buried in St. Pol Communal Cemetery Extension, grave No. B 21." The above is confirmed by his entry on the Commonwealth War Graves Commission website (CWGC), which also tells us that St Pol-sur-Ternoise is in France and was the site of the No.12 Stationery Hospital from 1 June 1916 to 1 June 1919. There are over 200 war casualties commemorated on the site. The 1911 census on Ancestry shows us the family living at 189 Pontefract Road, Cudworth. Father Charles and his second wife (as we know from the memorial card) Mary Ann may not have been living in Cudworth for long as only their two youngest children were born there. All the rest of the family were born in Nottinghamshire. George Alfred is 16 years old and working as a Colliery Pony Driver below ground. His ofather and two older brothers also work down the pit. The house has five rooms and in all ten people are living there, including a boarder John Thackery and a visitor Catherine Ruth Harrison aged 13. This last is interesting as SG told us his grandfather, who had lived at 16 Charles Street in Cudworth at the beginning of the 20th century was called Tom Harrison and this is the man in whose effects the memorial card was found. Could there be a closer connection between the men than just comrades in the war? In 1901 the Morley family are in Carrington, a suburb of Nottingham. Ellen Morley is still alive at this point and George Alfred aged 6 years is their youngest child. 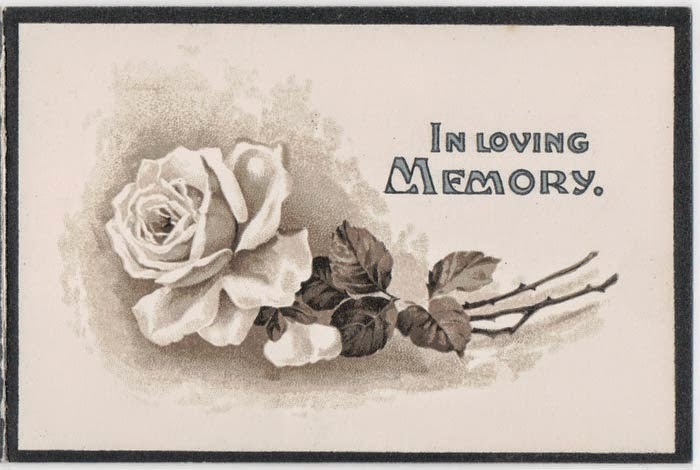 A search of FreeBMD tells us that Ellen Lettice Morley (thank goodness for the middle names being mentioned on the memorial card) died in Q4 (Oct, Nov, Dec) 1904 in Nottingham aged 37 years. Charles Henry Morley marries Mary Ann Harrison (ah, ha!) in Q4 1905, also in Nottingham. The 1911 census should tell us how long a couple have been married and how many children they have had in total, how many are still alive and how many have died. Unfortunately Charles and Mary Ann have not filled in these boxes correctly ... if you look back to the 1911 snip above you will see that the box immediately after the word married in Mary Ann's row has a red question mark in it - this looks as if it was added later as a query to the blank box. They claim there are four children to this marriage and all are still living - yet only two children in the listing can have been born since 1905, Catherine and Arnold. So where are the others? A search of the burial and baptism records for Cudworth St John's Church shows a very sad story indeed. The addresses of all the above burials fit the Morley family addresses that we know from the CWGC entry and the 1911 census. William Henry Arnold Morley died in September 1907 aged 22 months, so he was born around November 1905, rather close to the marriage of Charles and Mary Ann. There is a William Henry A Morley born in Nottingham registration district at the right time. Winifred Mary died in December 1907 aged 9 months, making her born in March 1907. There is a Winifred Mary Morley born in Barnsley in Q2 (Apr, May, Jun) 1907 who fits. So these are the other two children born to Charles and Mary Ann who are not on the census return. Continuing we see that Catherine Morley dies in November 1912 aged 2 years, this is the older of their two surviving children on the census. Later a Marjorie Edith dies aged 2 months in 1917 and a George Alfred dies in 1923 aged 2 years (so born 1920 to 1921). It is possible, after 1911, to search the birth records on FreeBMD cross referencing Surname with mother's maiden name. Putting in Morley and Harrison and restricting the search to 1911 to 1930 in the Barnsley area brings back five children born between 1913 and 1920. There is Marjorie born Sept Q 1917 and George A born Sept Q 1920. Plus three other children, Herbert, Francis and Ralph. Thank goodness, at least some of Charles and Mary Ann's children appear to have survived! A quick look in the St John's Cudworth, baptism records confirms the above are all Charles' children. I do find it very sad that Charles named his last son after his son who was killed in the war and whose memorial card started off this story, and that little George Alfred only lived a couple of years himself. A double whammy for the family and after so many other losses. Going back to the elder George Alfred Morley very luckily his Army Service Records survived the blitz and are available on Ancestry. He enlisted in October 1915 and appears to have arrived in France in April 1916. We now know he was 5' 8" tall and weighed 136 lbs, that's less than 10 stone, so he was a bit on the skinny side although the record also states that his physical development was good. He seems to have joined the 13th Yorks and Lancaster (1st Barnsley Pals) later than many others, his regimental number bears this out, it is 13/1482. He goes directly to France whereas the rest of the regiment had a period in Egypt first. We know he died on 1 August of 1916, but the records above show that he was wounded on 1 July 1916, which was the first day of the Battle of the Somme. He was transferred to the 12 Sty Hosp, at St Pol which must be the No.12 Stationary Hospital we noted from his CWGC entry. 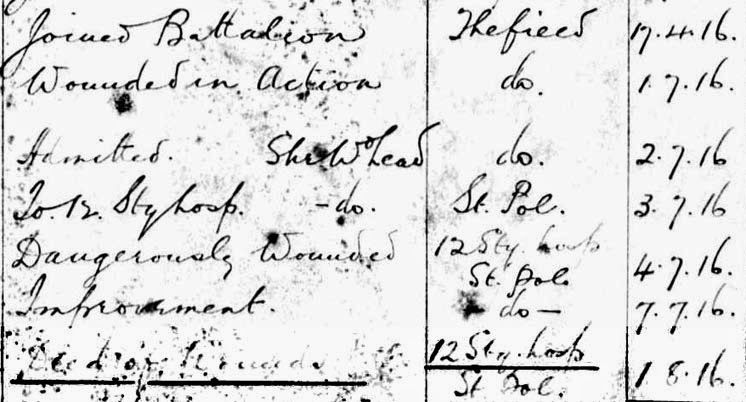 I am not sure what the actual nature of his wounds were - but could that note on the 2 July say Shell Wo Head? A head wound caused by a shell fragment maybe? If so he was indeed dangerously wounded as it states on 4 July. Despite some improvement in the first few days he died of his wounds on 1 August in that same hospital. A letter in his records gives us every clue we need to the reason why his memorial card was kept by SG's grandfather. All of George Alfred Morley's effects and his medals are to be passed to his father, "with the exception of a pocket wallet & contents, a wrist watch and letters which should be forwarded to Miss Amelia Harrison, 16 Charles Street, Cudworth, Barnsley". George Alfred's British War Medal and Victory Medal were sent to his father in 1921. George Alfred Morley is my Uncle and I still have his medals. That's amazing. Are you local? I live in Cudworth, as you may have guessed. It would be great to get a photo of George's medals to go with his story. 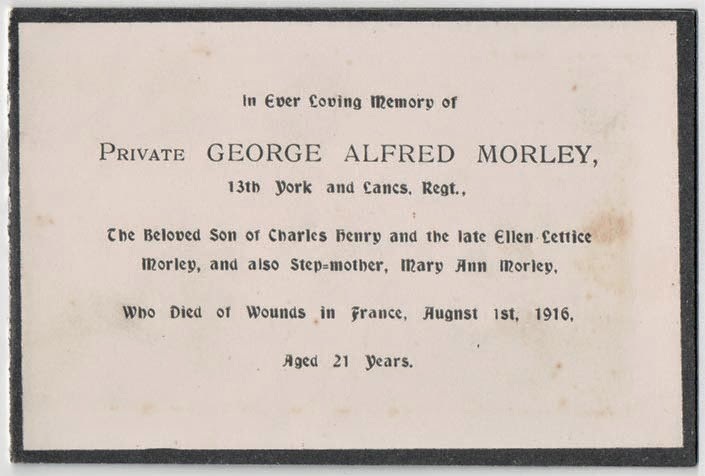 I have researched the Morley family on behalf of a grandson of Charles Leonard, one of George Alfred's brothers.George received a serious head wound and the family were told by one of his comrades that had he survived, his mental capacity would have been impaired. I was also moved by his request that Amelia should receive some of his personal possessions.His records show that he was AWOL on a couple of occasions,being late reporting back for duty. As an old romantic,I like to think that this was because he couldn't bear to tear himself away from Amelia.Unless any of her descendents know otherwise, I'm sure the speculation that they were sweethearts must be correct. That's great extra background information Carol, thank you ever so much for posting this. Part of the joy for me, researching these soldiers, is to try to put myself in their shoes and think about what it must have been like for them and their families a hundred years ago. I must admit to being a bit of romantic too - but the sweetheart theory does seem very likely! And thank you for reading my blog! just been reading your most interesting and well researched story.George Alfred Morley was my uncle. I still live in Cudworth,as does my brother Ian and sister Jean.Our father was Francis Dennis Morley,born at 181 Pontefract road in 1914,died in 1974. One day,we may visit Uncle Georges grave in france Would be nice to pay our respects. We were aware that he had died in france but didnt have any details. Thanks for bringing this to light. Thank you for reading. A shortened version of this story appeared in the Barnsley Chronicle last year (I think) with the pictures of the memorial card. I am a member of the Cudworth Local History Group who meet at the Library (Centre of Excellence) on Robert Street on Wednesday mornings.